Since 1911, the IU School of Social Work has been dedicated to developing competent, caring professionals. With our nationally ranked, fully accredited Social Work programs, we set the standards for innovative, inspired social work education. At IU Fort Wayne, IU’s Schools work together to create a unique health sciences environment based in one of the largest and most vibrant medical and social services communities in the region. Accredited by the Council on Social Work Education. BSW graduates are eligible for Advanced Standing in the MSW Program and for licensure as social workers (LBSW). Gain professional skills and networks in your senior year field placement. Transfer Single Articulation Pathway (TSAP) – certain community college students can organize a two-plus-two program with the first two years completed at a community college followed by two years with IU School of Social Work at IU Fort Wayne. In addition to top-notch faculty and classroom experiences, the BSW program offers an extensive practicum experience that provides students with the opportunity to demonstrate their learning and competency acquisition through practice application in a variety of outstanding social service agencies and health systems. Our BSW program positions our graduates to apply for Advanced Standing in our Master of Social Work (MSW) program, reducing the number of credit hours to complete the MSW degree. BSW graduates will also be eligible to apply for licensure in the State of Indiana at the LBSW level (Licensed Bachelor of Social Work). Our Master of Social Work (MSW) program offers a concentration in clinical and community practice with a focus area in mental health and addictions. You’ll complete two professional practicum experiences in concentration and focus areas under the supervision of seasoned MSW practitioners and will be prepared for licensure when you complete your degree. Scholarships available to qualified students who apply. Options to complete courses in a different focus area in the 3rd year at the IUPUI campus. Outstanding community partner agencies for MSW Field Placements. Preparation for LSW Licensure exam before graduation. Social workers are critical to the future of health and mental health care delivery in the United States and in advancing social justice and human rights in our ever-changing global landscape. With your BSW or MSW from the IU School of Social Work, you will become part of tomorrow’s solutions for complex issues. 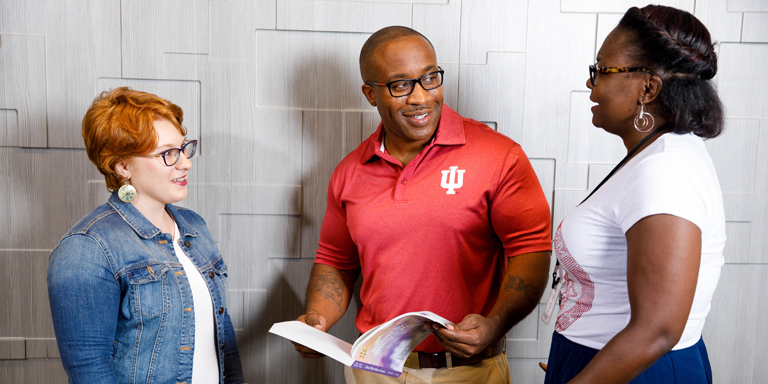 Start making plans now to be part of the next cohorts at IU School of Social Work. Looking for more information about studying social work at IU Fort Wayne?